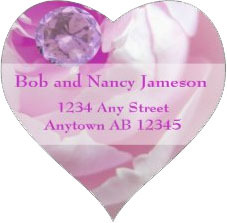 Unique Square and Heart Shaped Wedding Return Address Labels. 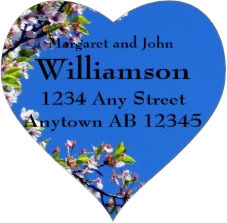 Inexpensive and Personal Design Element For Your Wedding Invitations. 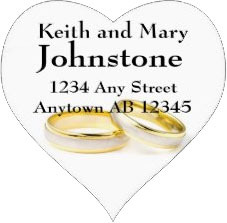 Easily include your information on either the square or heart-shaped wedding return address labels. 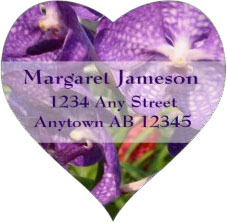 A good value measuring 1.5" x 1.5" with 20 wedding return addresses labels per sheet. A few sheets will do the longest guest list. 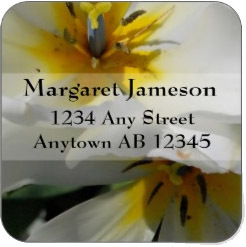 Printed in Partnership With Zazzle. Complete Satisfaction Guaranteed. 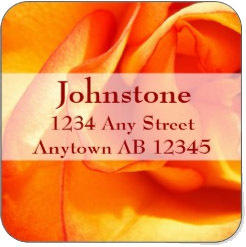 Close up of a flaming yellow rose with reddish tints is the dramatic background to this wedding address label. Your text within a transparent banner through the center. 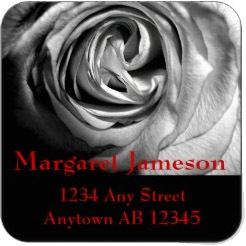 A stunning wedding return address label with an elegant long stemmed red rose filling the bottom against black. Formal and chic. 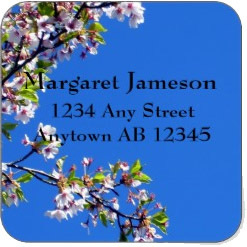 Spring flowers and apple blossoms against the bluest of skies create a fresh feeling. 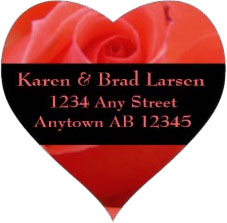 Your information in a black font through the center of this wedding return address label. 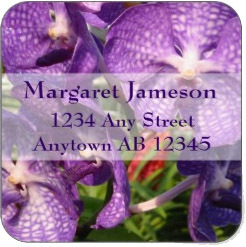 With an emphasis on the last name, the black text of this wedding return address label is set against a large white orchid. Great choice for thank you cards. 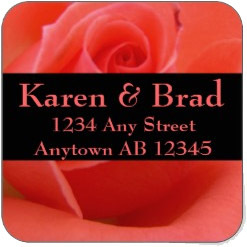 In close to a flaming yellow rose with reddish tints is the dramatic background to this wedding invitation address label. Your text within a transparent banner through the center. 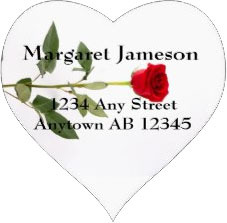 A stunning heart-shaped wedding return address label with an elegant long stemmed red rose filling the bottom against black. Formal and chic. 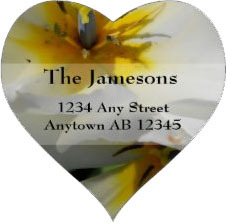 Wedding invitation return address label in the shape of a heart! 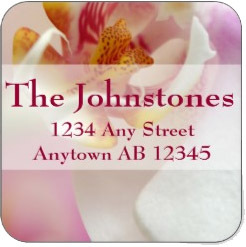 The background is filled with a white orchid offsetting your information in a garden green font. 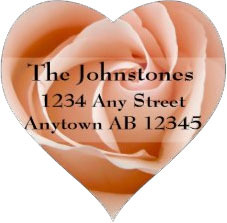 Delicate soft pastel orange rose is the background for your text on this highly detailed heart shaped wedding return address label. Stylish. 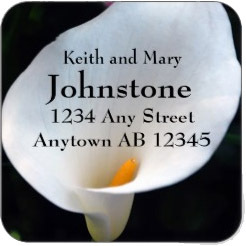 White lilies reveal their inner gold on this wedding address label. The black banner through the center holds your mailing information in coordinating yellow font. Very Spring-like. 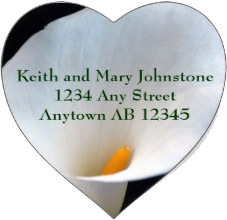 White lilies reveal their inner gold on this sister wedding address label to the one prior. The screened banner through the center holds your mailing information in a black font. Breezy and light. Simple and clean wedding save the date return address label. 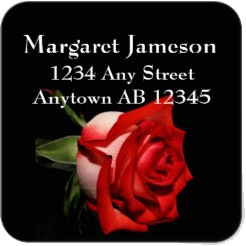 A single long stemmed red rose runs through the center with your name(s) above and your address below. Works with any style. 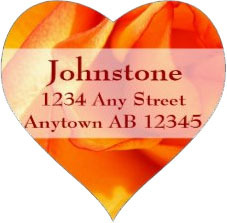 Delicate soft pastel orange rose is the background for your text on this highly detailed wedding return address label. Stylish. 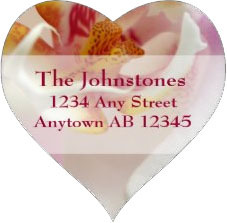 Simple and clean wedding heart return address label. 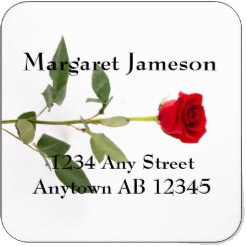 A single long stemmed red rose runs through the center with your name(s) above and your address below. Works with any style. 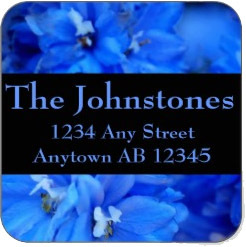 Fast Printing and Shipping provided by Zazzle. Learn More About Our Fast Turnaround. 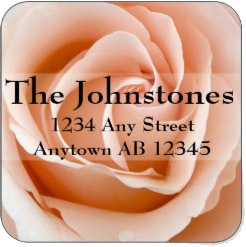 A white and pink rose hides a large diamond in the upper left of this wedding return address label. A slight screen through the middle for your address information in a matching pink font. Lovely. 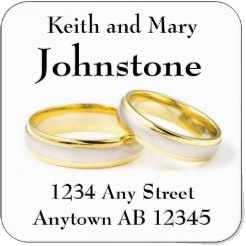 Two gold wedding rings are at the center of this wedding address label against a white background. Your personal information above and below in a black sharp font. Very clean, works with any wedding invitation look. 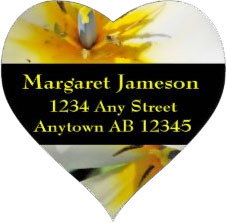 A white orchid reveals its yellow and chartreuse interior on this wedding return address label. A light screen backs up your text in a color coordinated font. Compelling. 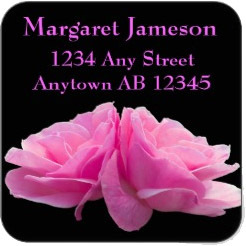 Wonderfully pink roses against black wedding return address label. 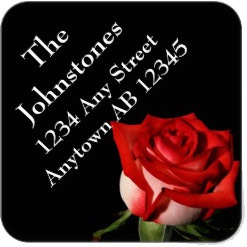 Two sharp pink roses fill the bottom and your pink text above. Stunning. 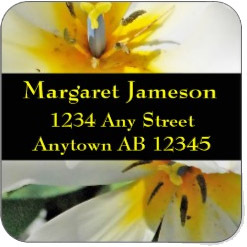 Two gold wedding rings are at the center of this wedding address label against a white background. Your personal information above in a black sharp font. Very clean, works with any wedding invitation look. 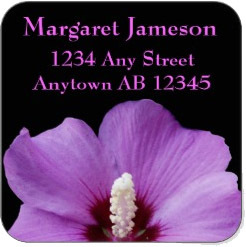 Purple tropical flowers are hidden by a soft white banner holding your information in purple text. A good variety of colors in this wedding invitation address label. 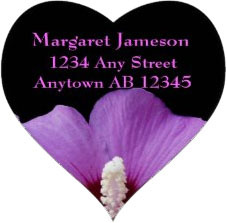 Perfectly purple floral wedding return address label has a violet hibiscus filling the bottom half. Your address against black in a coordinating purple above. Quite stunning. 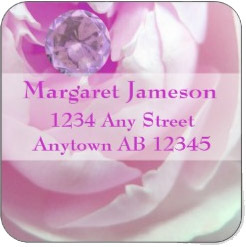 A close up of a white-tipped pink rose is the background for this wedding return address label. A black band through the center holds your text in a matching colored font. Elegant. 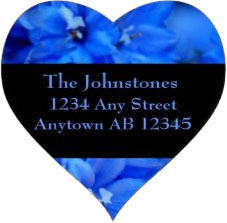 A sea of blue flowers fills the background of this wedding invitation address label. The black banner through the center displays your information in a coordinating blue font. Marvelous. 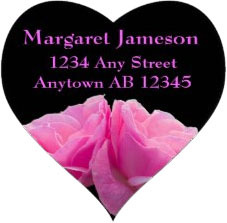 This black wedding return address label has a bright red rose in the lower right and your angled text in white in the upper left. Compelling formal design. 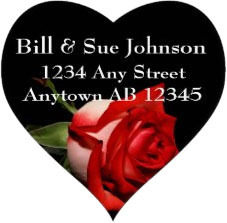 Stylish black and white rose wedding return address label. Your address information in red at the bottom over a black banner. Chic. 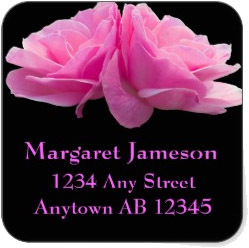 Two perfectly pink roses and your text in pink against a black background make this wedding return address label really pop. Wonderful.